The Company, a family-owned marketing services and printing business for over 50 years, expanded and reinvented itself several times to keep pace with technology and buyers’ demands. Today, it is a full-service marketing company offering print production, advertising/creative services, and inventory/fulfillment. Their clients include educational institutions, restaurants, sports and entertainment companies, health and medical companies, and more. In 2015, the Company invested in an extensive renovation of their facility. Soon after, they lost substantial revenues from an unexpected loss of clients and reduction in orders from other clients. The combination of these factors changed the Company’s financial picture dramatically. As a result, the Company’s bank asked them to secure a new lender due to past due payables, increased leverage, declining earnings and a $2.0MM over-advance in the loan structure. 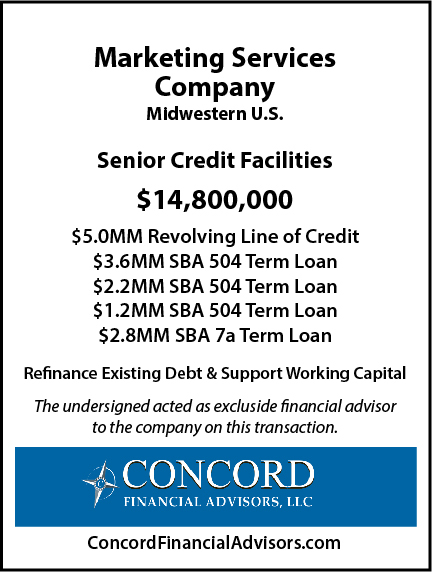 After several lenders declined the Company’s request for financing, the incumbent bank referred the Company to Concord for debt advisory assistance. Our due diligence and assessment of the Company revealed that an SBA loan structure was the best and only way to successfully meet our Client’s objectives. They needed the highest level of liquidity in order to cover the “airball” at the incumbent bank. They also needed to extend the amortization of the Term Loans beyond the traditional 5 years that most lenders offer in order to improve debt service coverage. Knowing that our Client preferred a local, full service bank with SBA loan products, we conducted an in-depth, targeted search among our network of lenders and screened key ABL Lenders and select SBA Lenders. We contacted one of our preferred Community Banks who was familiar with the Company and impressed by the Company’s resilience, management team, industry expertise and recent financial performance improvement. We were able to successfully arrange four SBA Loans and a Revolving Line of Credit from the one Community Bank and an Illinois-based CDC and pay off the incumbent bank 100%, including covering the $2.0MM over-advance. And our Client had over $1.5MM of excess liquidity at closing to finance additional growth after paying off past due payables.